Üsküdar Çevresi: Quotation: Princeton University A World History of The World, "Vietnam War: The Vietnamese Perspective"
We begin this exploration by looking at Vietnamese perspectives on the war, dating from its independence from France to the violent guerrilla warfare of the 1970s. Why start with Vietnam’s Declaration of Independence, which was written nearly thirty years before the Vietnam War even started? Because of North Vietnam’s communist policies, foreign powers saw South Vietnam as an important pawn for Cold War era politics and so rushed to support whatever side they aligned with. Soon, South Vietnam became a figurehead of the American government and the entire country was suddenly overrun with foreign presence. 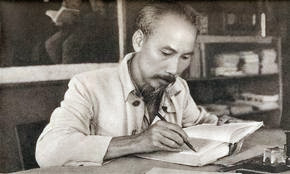 Such political phenomenon was common in Vietnam; they had long been subject to French colonial rule and thus had already adopted particular attitudes towards foreign involvement that are evident in the declaration of Independence. Ironically, Ho Chi Mihn based Vietnam’s Declaration of Independence on the United States Declaration of Independence, going so far as to call it an “immortal statement”. But, he does not give any such praise to Japan andFrance, the other two foreign powers he references. He criticizes France for “abusing the standard” of human rights that it hypocritically established in “Rights of Man and the Citizen”, claiming that their colonial rule has “oppressed our fellow citizens". France, he argues, has setback Vietnamese education, increased their reliance on opium and alcohol, exploited their economy and mercilessly taxed them. These imperialistic actions lead to the deaths of nearly “two million [Vietnamese] from starvation and only allowed for the Japanese to take possession of Vietnam, furthering its struggle with imperialism. Even before Vietnam became relevant in the Cold War struggle, it had experienced and consequently, resented foreign presence. How would these past negative experiences affect Vietnamese perception of increased American involvement in the future? 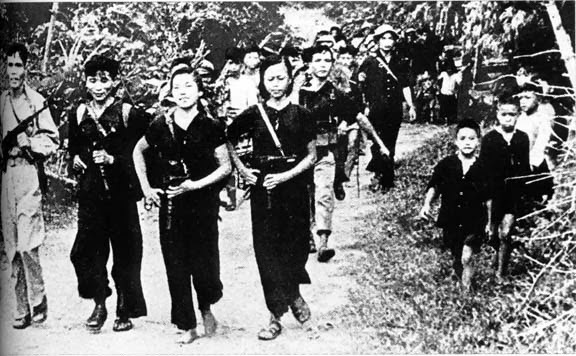 In the Manifesto of the National Liberation Front, 1960, it is clear that the Vietnamese did not necessarily appreciate having yet another foreign presence in their country. They had already fought off the French and the Japanese, and now had to battle the Americans for their sovereignty. In South Vietnam, the National Liberation Front argues that the “American imperialists have now replaced the French in enslaving the Southern part of our country through a disguised colonial regime”. Similar to how Mhin had accused the French, they accuse the Americans of “downright repression and exploitation of our compatriots” and of “abolishing all human liberties.” But, perhaps what they resent the most is thedestruction of South Vietnam’s political autonomy, declaring that the Ngo Dinh Diem government had become America’s “stooge” and that the two had formed a “clique” of “extremely cruel dictatorial rule”. The Vietnamese were inevitably very weary of “foreign sharks” but did not yet realize just how impactful American presence was in South Vietnam. 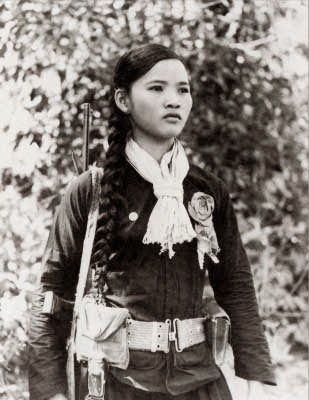 In A South Vietnamese Peasant Girl Becomes a Vietcong Supporter, it becomes evident that South Vietnam spiraling into wartime and that the Americans were making an estranged situation much more difficult than it already was. That is, they were influencing and arming countrymen against countrymen, brother against sister. The girl reflecting on her wartime experience in the article notes, “I could not accept that either my brother or sister must somehow become my enemy…” Yet, unfortunately, such a dilemma was probably the reality for many South Vietnamese. Suddenly their family and friends were being killed by an army that claimed:“we are here to fight for our land an our country” with intentions of “stopping foreign aggression” so that Vietnam can have peace. These foreigners, of course, are “men of another race called Americans [who] want to enslave us”. So these American foreigners essentially made it necessary for a rebel group to form and endanger Vietnamese people and destroy families. If the Vietnamese had wrote their declaration of independence after the Vietnam War, they clearly would not have praised the Americans for their “immortal words”. For the Vietnamese, American involvement and foreign presence in general has never been productive. Yet, in this western-centric world, we must question: was the involvement of America and the many other foreign powers in the Vietnam War justified? It is hard to say, but perhaps after investigating the American perspectives on what happened in Vietnam in our blog next week, we will be able to have some sort of an answer. Work Cited: McMahon, Robert J. "Manifesto of the National Liberation Front." Major Problems in the History of the Vietnam War: Documents and Essays. Lexington, MA: D.C. Heath, 1990. N. pag. Print. McMahon, Robert J. 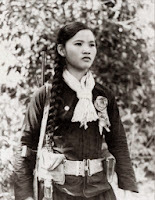 "A South Vietnamese Peasant Girl Becomes a Vietcong Supporter." Major Problems in the History of the Vietnam War: Documents and Essays. Lexington, MA: D.C. Heath, 1990. N. pag. Print. McMahon, Robert J. "The Vietnamese Declaration of Independence." Major Problems in the History of the Vietnam War: Documents and Essays. Lexington, MA: D.C. Heath, 1990. N. pag. Print.